Today we’d like to introduce you to Reggie Clements. Reggie, please share your story with us. How did you get to where you are today? It’s amazing how one event in your life changes your entire destiny. As a child, I grew up on a farm in Tennessee where I learn the basis of hard work and helping others. These two factors have drastically shaped my life and without these two friends, I don’t know how my life might be. Growing up and working on a farm taught me many lessons which I’m applying today? When you live on a farm you have to be a creative thinker and proactive. One bad decision can ruin an entire crop, procrastinate and you will lose a season of crops, you literally could not afford to make a mistake. You had to be patient enough to choose the right time, realistic enough to have sound planning, flexible enough to adjust overnight, and prepared enough to be right consistently. My motivation and commitment were learned and forged in this environment. Looking back through my life I’m able to put together the dots better. I can see the fundamentals which I applied in all of my life choices. When I first arrive in Los Angeles in 1984 I was in a completely different field. I joined my first health club in LA and this place launch my fitness career into high gear. My first opportunity to used fitness as an avenue to helping people started in 1989. I and a friend started a health club and here I trained every day, and over the next 5 years, I trained over 10,000 hours of personal training. After the 5 year period our health club closed and I went to teaching group classes along with personal training. In 1994 I started teaching group classes at the world renown Voight Fitness in Los Angeles and Santa Monica. I had reached one of highest levels as a group instructor. This environment again prepared me to not just show up with a good class but an exceptional class every day. In 2001 I join a group of trainers who were pursuing functional training. I decided to stay with the co-op and moved to Santa Monica and focus on training professionals who were deconditioned and those who have been injured leaving physical therapy. My focal point was to bring the best of my past and combined it with a functional training concept. This was a great decision. Now it’s 2016 and still with me is the same fundamental concepts I grew up with on the farm. At this point in my life, I bring all the experiences of my journey with me from track and field, martial arts, boxing, weight training, aerobics, and sports. 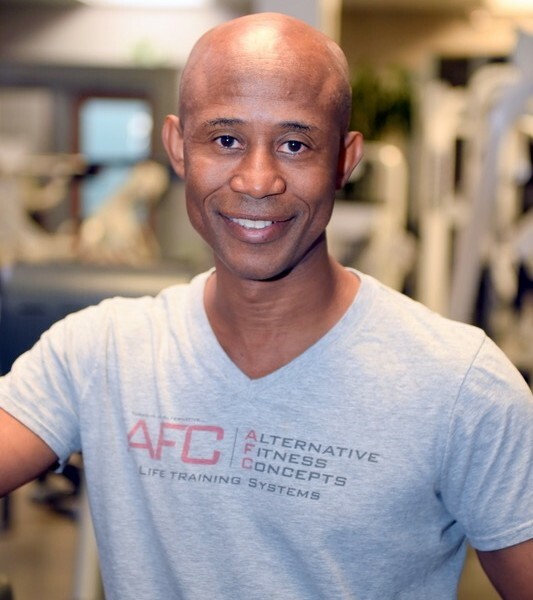 I was lucky at this point in my life because I was training in a private training studio with a number of other trainers who was also entering the functional training format. I was torn at this time to go back into business for myself or be part of this co-op of trainers. Over the years I have been on this journey to become a better trainer. I had this hungry to provide the very best service possible to my clients. I personally didn’t want to focus just on weight loss but to give my clients more than just a workout which would make them sweat or build muscle. I know many of you have observed workouts in the gym which were scary and this included many trainers. I always felt a little anxiety watching people go through these workouts. Their technique and form were bad and still the trainer would find some way to torture this poor person mainly because they wanted to be fit and never correct their form. Exercising with the bad form just didn’t make good sense to me. Wanting to become a better trainer made me take a serious look at what I was doing and what others were doing also. Fine tuning and focusing on the details of the human body changed my entire training method. Achieving excellence for all of our clients was the goal. Know it’s 2016 and I’m one of the busiest trainers in Santa Monica California. My desire to work hard is part of my success and my desire to share the knowledge of excellence is what I live for every day. Today we are known as Alternative Fitness Concepts. Our name makes the statement that we are not the ordinary but something different. We strive to let everyone who wants to train with us experience one free week of training before they pay anything. We believe letting clients experience the actual act of working with one of our trainers will help them know the difference for themselves. Our action is to show people we deeply care about them. Today we are in the process of developing an online workout where more people can reach the level of training we provide. After we complete this project next project is to expand our concept in different areas throughout the US. No, it hasn’t. The biggest challenge was going out of business in the mid-nineties. A friend myself took over a health spa in 1989 and went out of business in 1994. It was the lowest point I can remember and at this time my father passed also. I basically lost everything. However, I started back the next day after I closed the doors and went and found a job and never looked back. It wasn’t easy because I had no car and was making very little money. But I stayed focused on doing the work of getting up every day and putting forth the action. It paid off. This is a very good question and actually, I have never really thought about quitting. However, I have had many moments which were really tough. It’s interesting for me to think through this because most challenges and obstacles I had I didn’t really see them as tough times. To me, they were merely steps of life. These are some practical challenges I had in my life. I started personal training in 1987 and in 1989 I went into business with a partner where we took over an existing fitness center. We went out of business in 1994. I had lost everything at this time. This was a very low spot in my life. I had to move in with my sister at this time. I had no income or savings all was gone not even a car. However, I had a lot of knowledge and experience and I needed to decide what to do next. This was the most stressful time of my life. However, I can’t remember how it exactly happens but I had an employee which use to work for me call me right at the time this was happening. I was at home in the bed and I never forgot what she said. She reminded me of all the knowledge I had and told me to go to Voight Fitness and teach there. See Voight Fitness at this time was the best fitness studio in the world. So after 1 day of closing the fitness business, I called Voight fitness. I’ll never forget this conversation, they weren’t too impressed with me. However, this didn’t stop me. I caught my first bus on this day. I had no idea how to get to Voight Fitness but I went anyway. It took about 3 hours because I just got on the first bus coming alone which took me in the wrong direction but I finally made it there. When I walked in I asked the person I spoke with on the phone. I walked up to him and shook his hand and told him who I was. Believe it or not, he hired me and I taught a class that evening. He said he liked that I didn’t accept no. Chalk it up for being persistent. Doing this same time I decided to start personal training again. I had zero clients at this time. I have always lived by the idea action speaks louder than words. My idea was to get 10 new clients at a very inexpensive rate in 30 days. I believed if I do an exceptional job for them then people who they know will see them and want to use my service also. Well, I did get my 10 people in 30 days and know it’s 20 years later and I’m still here. Being committed to doing an excellent job with a client no matter what someone pays you was a critical step to starting my personal training business and growing it. Action does speak louder than words. The answer to the question of how I overcame tough challenges is rooted in the early stages my of life. My father and mother blessed me with the idea hard work will solve all of my problems. My father also gave me a book when I was 18 years of age called A man is what he thought. At this time in my life, I had no idea how profoundly this book would shape my life. I didn’t even read it at first but one day I picked it up and started reading it. The gist of the book is your mindset affects your everyday experiences. That you can also change your life by changing how you think. I grew up watching my father do everything he could to help people. This character trait was also passed on to me. I’m driving by this basic instinct to help someone’s life be better. My second oldest sister has influenced my life drastically also. She told me ” that life is hard and if it was easy everyone would be successful”. They have prepared me to know every day I awake there might be a challenge waiting on me. This is life, some days are not as bad as others but I must prepare myself to deal with the difficult days. So, whenever I had a difficult day or a challenge in a day I saw it as an opportunity for me to learn. By changing my mindset I accept every day as it comes to me. My job is to make it better for me and others. This is what I would tell someone starting out in a personal training business in Los Angeles. If you want to be in the personal training business there are 4 basic options. Rent a space and develop your business, find a personal training gym where you can pay rent each month in a co-op, work as a personal trainer for a gym or another trainer, or become and independent trainer where you go to clients homes or outdoors. My advice for all 4 is to have a basic understanding of business structure. If you don’t, take workshops to learn, go to a community college, and buy and read books on business. You are going into business and you would greatly benefit from this knowledge. Go to a workshop every 6 months, read as many books as you can on all areas which will improve your personal training. Knowledge will improve your training and your motivation and commitment to yourself and clients. Make sure you become certified. I personally like NASM certification because the program puts together almost 10 years of knowledge into 1 certification and it gives you order and discipline to follow. Do not train for money, focus on your client make their life better. Care for them by investing in yourself and everything will be ok. Think of yourself first and you will struggle. Remember people walk into your front door, not money. Your success depends on you becoming very good at showing people you care about them through your actions and knowledge. Your clients are the bloodline of your business treat them with the highest respect. Prepare yourself daily, show up with exceptional tools so your client will feel you care about them. Have a basic business plan or just a plan when you start. In order for you to become successful, you need a starting point. However be ready to adapt as you go forward. Remain flexible with your plans they will change but this is a normal progression as you go forward. Train yourself regularly it helps you experience what your clients are going through. Be innovative in your approach to training and life. Be knowledgeable. Be persistent. Be flexible. Be caring. We are excited about bringing the type of training we do to everyone. The base of our programs is rooted in helping clients develop good posture, teaching mobility along with strength training, and that good form and good technique have to be taught over bad form. We help clients attain optimal levels of fitness, reverse the effects of aging and remove them from pain associated with exercise, and living. Neck, back, hip, knee, shoulder, ankle, and wrist pain. We believe that everyone wants to be fit but just doesn’t have the proper avenue for them to attain fitness training which appeals to them. We have dreamed about bringing our training concept to a larger population so more people can be fit from it. We are proud to announce we are in the finishing stages of launching our online program based on the training concepts we use every day in the gym. We call it The Muv Method. We are very excited to launch this program. It will introduce the public to professional fitness training programs which every person deserves. This upcoming year I would spend more time traveling in the United States. My goal is to travel to most of the national parks within the next two years. I train 7 days a week and when I take off I like to spend it focusing on my family. This is where I’m recharged with positive energy and caring.